Jesus said, "Peace be with you! I never feel quite so inspired by the beauty of creation as when I stand on a mountain top and survey a panorama of snow-covered peaks in glorious sunshine, rocks and couloirs set in sharp contrast against the bright blue heavens. Such was my daily experience on our recent break in the French Alps, trying to remember how to ski, and trying to forget the dubious delights of wet and windy Britain. As I read this verse from the Psalms as part of my morning prayers on the 14th, I reflected upon how important to me have been various mountains and little hills, from the Wildspitze and the Schatzberg to Ilkley Moor and Cleeve Hill, each in their own way bringing peace, and perhaps, righteousness. It's not so much that I feel closer to God because I am further from sea-level, in a Tower of Babel sort of way (the morning reading from a few days beforehand), but that I feel further away from the devices and desires of my own heart, the worries and cares of an inward-looking world, above which I need to rise and to lift my heart up unto the Lord. But mountains are not just about peace, for there is also fear and danger to be associated with their unforgiving magnificence - extremes of weather and temperature, steep descents and icy paths. Part of the thrill that comes from skiing is the ability to cope with difficult terrain and frightening situations, sometimes at great speed, pushing yourself to the edge and beyond. From the peak of Vizelle, high above Courchevel, my teacher and guide brought me that day to the brink of a tricky little run off the shoulder of the mountain. I craned my neck to look over the edge and keep my balance, didn't want to do it, didn't think I could cope. I was afraid. But, having showed me the difficult path, he led the way and asked me to follow, and his confidence in me gave me the courage to proceed. Well, he was right, and that's why I am writing about holiday `slides' rather than holiday `snaps'. At the start of the new year the new Parish Website was launched on the world wide web. No longer does it piggy-back on my website but has its own domain name and internet service provider. The content is growing. Recent additions include scenes from the Parish Crib Service and photographs of the Ministry Leadership Team. There are pictures too of Fr Stewart Kasembe on the back of Fr Paul’s motorcycle as well as in more reverent poses. Each month, a few days after publication, most of the content of this magazine are posted. A big advantage of the website is the use of colour, which is especially valuable in the photographs. Occasionally I might slip in some extra pictures, such as those of the font in St Mary’s which has been the subject of the Editor’s recent questions. Our website is not just aimed at the congregations of Prestbury. Its real value is for readers outside our parish life, and not just those who have moved away and wish to keep in touch. It is another window for people to find out about us and, I hope, make contact. If any of you can provide useful content for the website, I shall be very pleased to hear from you. Meanwhile tell your friends our web address. After the publication of pictures of the Ordination, Fr Paul has become somewhat of a public celebrity, being instantly recognised in church circles wherever he goes. He tells me they love the Fr Paul Dressing-up Kit! As always, let us know (Peter Brown, Sue Read or me) if there is any particular book, or any kind of book, you would like included. Last year there were few takers for small books of prayers, or for books about the Bible in general, but they can easily be provided if they are wanted. Sunday mornings in Lent: we hope to have some of our neighbouring clergy as guest preachers. Sunday evenings in Lent: a series of teaching followed by discussion. One possibility is to use Gerard Hughes’ ‘God of Surprises’, which is now available as a cassette with study booklets. Weekdays in Lent: participation in the Ecumenical Lent Course, ‘All Together Now’, which explores the journey of faith in words and music. More details at the Open Meeting of Churches Together in Cheltenham on 9th February at 7.30pm in St. Nicolas’ Church. If there is sufficient interest, we will also run one or more weekday study groups in the Parish. The focus will be the Sunday readings during Lent, also using material from Christian Aid. Clearly there will be lots going on. Please make a serious effort to ‘take something on’ this Lent. Look out for further details! Our parish has undertaken to provide the crowd for the crucifixion scene of the Churches Together in Cheltenham Passion Play. This will take place on Good Friday afternoon in Imperial Gardens. If you are able to take part in this tremendous act of witness in the town centre, please give your name to David Price. As former link member of the Prestbury branch of the MU, which has now lapsed, I have received a Christmas card from our link branch in Australia. The card says ‘To Our Dear Sisters, May the blessings of this wonderful season be shared with all the members of your branch. Fond love in His precious name across the world from all of us’ and is signed by 27 members of the branch at St Matthew’s, Albury, NSW. Enclosed in the card are an article and photograph of Albury’s new rector, Canon Keith Brice, and his family; also some poems, one of which is printed here. The friendship sprung from pen and ink. If any former member of the MU in Prestbury would like to see the card and enclosures please ask me. To celebrate the Millennium there will be a Diocesan Eucharist in Gloucester Cathedral at 11am on Lady Day, March 25th 2000. Our celebrant will be Canon Neil Heavisides and the address will be given by Mrs Pat Harris. We hope to process all our banners including those from lapsed branches if we can. Have you any used pairs of spectacles lurking in drawers or cupboards? Any style, any age, with or without cases. Please have a look and bring them to church during February. There will be collecting boxes in both churches. The Mothers’ Union are planning to send another shipment to the Third World this year (over 700 pairs went to Rwanda last December). Should you have so many that you can’t fit them into the church box, do give me a call and I will collect them. Many thanks. I have back numbers of magazines from the Church Missionary Society and the Leprosy Mission. They will be available on the table by the door at St. Mary’s for you to read if you are interested. This month’s musician is Kathryn. I play a recorder. I have been playing it for 4 months. Miss Hawkins teaches me at school in a club. I can play 3 notes at the moment. Soon I might play in front of the school. I like playing my recorder. One of the things I like is helping with lunchtime recorder classes at St. Mary’s Junior School. In December I accompanied Mr. Vaus to Cleeve Hill Nursing Home with a group of 9- and 10-year-old recorder players. The fourteen young musicians gave a short recital of Christmas carols, some in unison, some in two-part harmony and some with percussion accompaniment. Several of the residents joined in singing the words, and it was obvious that both children and residents enjoyed the occasion. I had not heard this particular group of players since last summer, and I was most encouraged by their continuing enthusiasm for, and progress in, their music-making. Dear friends, I hope this finds you well. I’m fine and safely arrived in B’ham yesterday at about 12.15pm. I thank God for bringing me safely to B’ham. 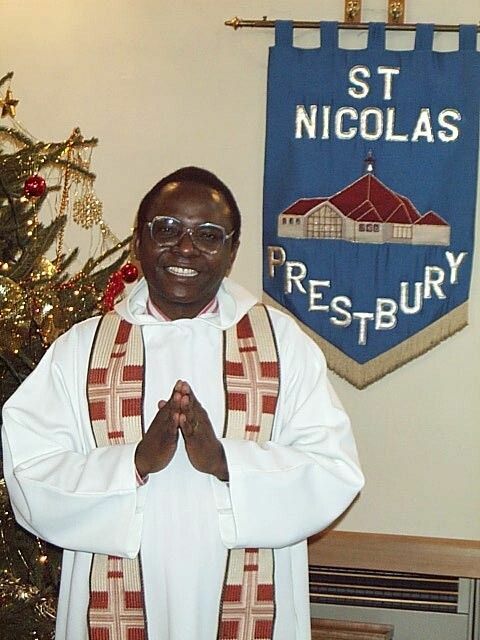 I would like to thank you all for your unforgettable hospitality you offered to me during my stay in Prestbury Parish. I really enjoyed. I wish all the best for a New Millennium and a new start in serving God. May the blessings of God Almighty come with this. AMEN. Everybody seems to have enjoyed Fr Stewart’s visit to the Parish and many will have been shown his photographs of family and home in Tanzania. He would be very thrilled to take back with him photographs of his time here to show his congregation. Perhaps you took photographs while he was visiting or you may have a nice one of the village or church which you could spare for him? If so, would you be kind enough to drop them in on the Parish Administrator at the Vicarage, please? What is the Local Ministry Team supposed to do? People have been asking the question 'What is the Local Ministry Team supposed to do?' and have found the members of the team searching for an answer. Well we are beginning to find out. enabling those gifts to be used to fulfil the needs." At the turn of the 20th century many more people went to church than do so today and there were more clergy. This made it possible for the vicar to tend the whole of his flock. These days we have an electoral roll in the hundreds in a Parish of eleven thousand people. So the problem is clear. There is no way that the vicar can even know what his flock needs let alone be able to do anything about it. Hence the 'Local Ministry Team' idea. Members of the team are not surrogate clergy, but with the clergy part of the team, they are much more 'at the hub of things' and can therefore be the eyes and ears of the Parish. How does this differ from the existing PCC and specialist committee structure? I believe the answer is 'fundamentally'. The relationship between the Local Ministry Team and this structure will become clearer over the next few months. One thing is certain - the PCC has the ultimate power of sanction. Watch this space. Brian: I was quite touched by the content of your message. I would like to have it published in our church magazine. You never know there may be some who remember your family. The website is still new and I would like to show our congregation how effective it is. Would you mind? John: No, I wouldn’t mind at all. For your information, my grandparents’ names were Frank and Florence PARKER. My grandfather was for many years until his retirement the head groundsman at Cheltenham College - we often used to go and see Gloucestershire play cricket on the ‘square’ that he had prepared. As I said before, he was a member of the church choir, and he slaked his thirst many times at The Beehive pub!! My mother’s maiden name was Mary Elizabeth PARKER and as a girl she attended the school in Bouncers Lane. She has two brothers, both are still living, Cyril - who lives now in Bristol, and Fred - who still lives in Shurdington. Brian: How did you find the site? I only submitted details to search engines last night! John: I learned the web site URL from my mother and father, who happened to be at the football match in Cheltenham on Saturday (Mansfield Town v. Cheltenham). (They are both nearly 80 by the way and still going to football matches!!!) On their way home, they stopped in Prestbury for a nostalgia ‘fix’, and saw the web details advertised on the notice board in the church porch. Incredible, eh!! A question for you - do you know of any PARKER, FEBERY, ALLEN or WHITTLE living today in the Prestbury area? If so, I may be related to them. We should like to thank and congratulate you on the Form and Content of the Parish Magazine 1999. It is really interesting and it tells us clearly all that is going on and makes us feel part of the Services and Activities. We live at Capel Court and cannot now get to Church. Fathers Stephen, Michael and Paul come and serve us lovingly. We enclose the magazine subscription. Would it be possible for someone to deliver or post it when it is published? It is rather 'hit and miss' when we see it in the library here. We recently had the pleasure of Fr Stewart staying with us for a few days. Whilst he was collecting his email I thought it a good idea to show him the parish web site. He was very impressed with this, and all of the information on it, including the photographs of the people he had met. We then thought it would be a good idea to look at some other religious web sites to see how they compared. The first one we looked at was the official C of E site www.cofe.anglican.org. This looked a bit boring, though it does seem to have changed since our visit at Christmas - for the better, though not all of the areas seem up to date still. It seems quite difficult to find where to ask any questions, or go for more information, especially compared with the other sites we looked at. At this point it seemed a good idea to look at the competition. We started with www.islam.org this had many different areas, a means to ask questions and find out more information, it certainly looked much better for those with no religious experience. Also in a similar vein were www.methodist.org.uk and www.baptist.org.uk all of these looked very interesting and claimed to have been updated recently. The C of E site does enable you to find your local Parish Church (and the Vicar's email address) - you just need to know the name of the town you are looking for. Whilst the C of E site is not too bad, many of the others look more attractive. Perhaps if any readers (or web surfers) know of any more interesting sites they could ask Brian Wood at web prestbury.net to include these as links on the Parish web site. Does anyone else have any views on web sites they have visited? Take care when typing in the addresses or you will get the American versions - you have been warned! We shall meet on Tuesday 1st February from 10am till 11am to pray informally for our clergy, our parish and our world. It’d be lovely to see any new faces. If the thought of praying out loud fills you with terror or horror, don’t despair, don’t say you could never do that, don’t knock it till you’ve come along and tried it. We don’t bite and neither does our Heavenly Father to whom we pray. I do realise that it clashes with one of our mid week communion services, but the time just happens to suit those of us who have been involved so far. If you’d like to check any details or find out when the March meeting will be ring Beryl Fowler. If another time and place would be better for you and some praying friends then why not get together and get praying!